In brief: Microsoft’s series of Surface computers have been some of the most experimental, interesting and successful Windows devices seen in years. It seems that Microsoft is seeking to continue that trend by releasing a modular Surface Studio desktop PC with a separate monitor and Surface computers with AMD processors, amongst other things. The leaks come via tech journalist Brad Sams, who revealed or confirmed five key ideas coming to the Surface lineup in his new book, Beneath a Surface. As even Sams notes, however, rumors should always be taken with a grain of salt and roadmaps are subject to change. Microsoft’s Surface Hub 2, a sleek and gigantic touchscreen aimed at businesses, has been heavily praised for its modular design that lets users swap out a cartridge that contains the processor. 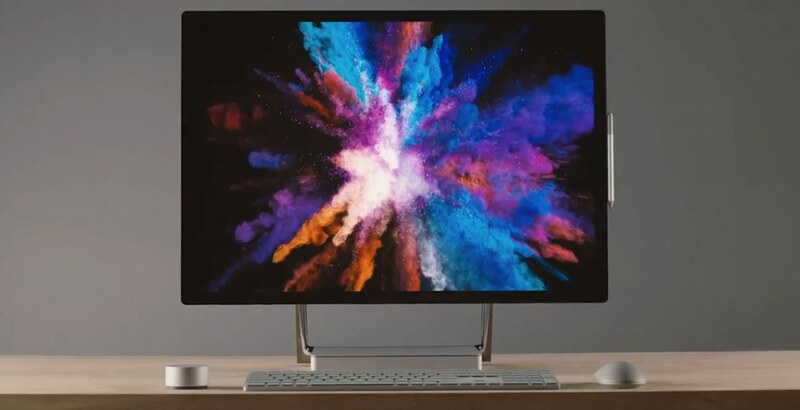 Likewise, the Surface Studio has been the de facto choice for many artists and professionals due to its amazing display with stylus support and its powerful specs – so Microsoft has apparently decided to combine the best parts of both devices to create a modular Surface Studio 3. The idea of a modular Surface Studio isn’t all that new, in fact, Surface chief Panos Panay hinted it might be coming a couple months ago. Now, however, Sams has revealed that all the core components such as the processor, graphics card, ram and storage, will probably be upgradeable via a similar cartridge system. Due to the difficulties of creating a modular design, we’ll have to wait until 2020 to see it. The best feature of the Surface Studio has always been the monitor and its fantastic hinge design – which will apparently be going modular, too. Microsoft will finally sell the monitor separately and allow users to have their own computer as input. Regarding why Microsoft hasn’t done this already, Sams said: “the Surface Studio 2 had a starting price of $5,499 and when I asked Microsoft following the announcement how much it would cost just to sell the display, they quoted a figure of about $2,000.” The monitor will retail for a lot less than that when it hits stores in 2020. Microsoft’s most popular Surface devices, the Surface Pro and Surface Laptop, will also be getting two serious upgrades when they’re updated late next year: USB-C and AMD Ryzen processors. Possibly due to Intel’s struggles with perfecting 10nm, AMD’s next Ryzen will offer better performance and higher power savings. It’s unknown, but likely, that it will be 7nm based. It was bizarre to see Microsoft exclude USB-C this year, but according to Sams, that was very intentional. "This was not a technical limitation," he writes. "Instead, Panay is said to have made the decision himself, so his engineers did not include the ports when refreshing the internals of the devices for the updated Intel chips." Apparently, the port has been saved for a redesign that will introduce rounded corners along with slimming the bezels and reducing the thickness of the devices. Lastly, Sams discussed Microsoft’s most highly anticipated device: Project Andromeda. Andromeda is Microsoft’s attempt at a device with a folding touchscreen and rumors have claimed that it’ll be a phone for years, but apparently, that idea has been canceled. Instead, Microsoft has decided to make the device larger in order to cooperate better with Windows 10, and it will release as a folding Surface tablet towards the end of next year.